Posted by Dad on July 1st, 2017 in Charts Add Your Thoughts! A hundreds chart? If you’re wondering why, for good gracious, you’d use one of these to teach counting, or even multiplication, you definitely won’t by the end of this post. So what’s wrong with counting, you ask? When the kids learn to count orally, they’re often just learning a pattern of words, almost like a song. Oral counting is great, as long as there’s a mental model of number sense to back it up. That’s where these awesome hundreds charts come in. A hundred chart provides a visual representation of both quantity, and of the relationships between the numbers in the rows and columns of the chart. You’d be amazing how many kiddos can recite the numbers from one to a hundred in order, but when they’re confronted with reading a number off a page have trouble. We struggled here with the difference between 41 and 14 more times than I care to admit. Roll the chart up into a tube and count around and around and around…Nothing makes it clear that the numbers go in a continuous sequence like rolling a hundreds chart up and counting around the bend. Cut the hundreds chart up, then put it back together again.We have an unending fascination with tape here, so this is always a winner. Print out one of the hundreds charts, cut it up randomly then tell the kid to put it back together again with tape. Bonus points if you time them. A good starter is to do this with one of the color hundreds charts which provides some color-cues to help make the assembly go faster, but you should move on to the black and white charts once the concept is clear. Color in a hidden picture puzzle on the 100s chart.There are a ton of these online, but obviously the best hidden picture puzzles are right here at DadsWorksheets! Play race to one hundred on the chart.You’ll need a game piece (or two if you’ve got more than one kiddo on hand) and a die. Start with both players on number 1, and have each player roll the die then move their piece that many numbers forward on the chart. The first one to get to 100 wins. Try having them only roll a number at the end that lands exactly on 100 to win. You can do skip counting easily on the hundreds chart. A great activity is to print a hundreds chart and color in odds, evens or multiples of 5. Or, color multiple patterns and see where they overlap, a great start on understanding factors of numbers. Skip counting provides an opportunity to begin understanding the properties of certain sequences of numbers (for example, that adding two to an even number always produces an even number, or that multiples of 5 always end in 5 or 0). Even more so than using a multiplication chart to memorize multiplication facts, skip counting also helps kids build the number sense necessary for multiplication. Find prime numbers using the Sieve of EratosthenesOnce you have a student who understands multiplication, division and the idea of prime numbers, you can use a hundreds chart to perform the Sieve of Eratosthenes, which is really simply way to not only introduce primes, but to discover one way that they can be revealed. Any of these activities work well with the 100 chart or with the 120s charts available at the link as well… You’ll notice sometimes when kids learn what follows 100, it can be a challenge. That’s why some of the Common Core activities work with 120 instead of 100… It’s just a large enough range to get you well into that third place value, and it also fits nicely into some of those times twelve tables that you’ll undoubtably come across soon as well. Whether you’re building up number sense or just using these number charts as a way to learn your math facts, I hope these new charts help move your math lessons on down the highway just a bit faster… Do you have some other great hundreds chart games or activities? Leave a comment and let me know! No really, I’ve had it. With HTML that is. We’re coming up on the 9th anniversary of DadsWorksheets.com, and as much as I’ve tried to ride the waves of changing HTML standards, print media style sheets, flexbox and every other solution to wrangling layouts, I’ve finally reached the conclusion that getting consistent printable output from a web page is a bridge too far. So, dear friends, you’ll notice that over the last week or so I’ve converted all of the worksheets to PDF files. You’ll navigate to them just as you did before, but the worksheet display will be subtly different. Answer keys, where appropriate, are included in the files now. There’s a PDF viewer for each worksheet, and you’ll be able to print directly from the browser using the big “Print” button just as you always have, or alternatively you can download individual worksheet files by clicking the button in the PDF viewer’s controls. If you have trouble printing from the browser (and yes, I’m talking to you Safari), you can always fall back to downloading the worksheet PDF file and printing from Acrobat or another PDF application. The good news is that this step will allow me much more control over the worksheet layouts. Right now many of the worksheets still look just like they always have, but I’ve completely updated the multiplication worksheets and the multiplication charts. I think they look amazing, and I hope you do too. If you liked what I had on the site before, you’ll love these new worksheets! I’ll be updating the addition, subtraction, division and the other math topics over the coming weeks. Meanwhile, if these new multiplication worksheets or multiplication charts give you any trouble, or if you have any comments on the new layouts, please let me know in the comments below! Meanwhile, thanks as always for using the site and helping make DadsWorksheets one of the best free math resources on the web! Posted by Dad on June 22nd, 2017 in Strategies, Worksheets Add Your Thoughts! Are your kids at risk of losing over two months of math skills? It’s 120 degrees here in Arizona, and we’re blazing through summer vacation even faster than you think… And along the way, every one is trying to avoid summer slide. No, I’m not talking about a fancy bit of seasonal playground equipment. I’m talking about the loss of knowledge that typical students incur over their time away from the classroom. While many students who are motivated to read over the summer break will actually improve their English skills, students typically lose over two months worth of math learning progress over summer vacation. It can take a corresponding amount of time at the start of the new school year to get back on track. Many of these statistics come from the RAND Corporation, which has studied the effects of summer learning loss, as well how summer learning programmings can reduce or reverse these effects across various demographics. Harvard University has weighed in specifically on math learning loss and this post provides some hints at activities you might consider to help retain math skills over the time away from school. But obviously, those two months of lost math learning is something we can address right here… One of the most important skills is math fact fluency. There’s a reason we practice math facts so rigorously… They are involved in nearly every math task you perform, and accurate instantaneous recall of math facts is a huge success factor in any other applied math skill your little geniuses will encounter. Keeping fact recall sharp is an easy way to stay ready for back-to-school! If you’ve mastered addition and subtraction, summer can still be a great opportunity to introduce multiplication or division… Regardless of where you’re at, you’ll find all the practice worksheets to keep busy through the summer below! Regardless of how you plan to turn that summer math slide into a climb up the monkey bars, I hope your vacation is filled with lots of fun! Now THIS is How You Practice Math Facts! Yes, I’m all about the worksheets. And pencils. But that doesn’t mean there aren’t times I loosen things up a little bit and amp up the creativity. Because no matter how much fun that old-school math fact practice can be, I know the munchkins need a change of pace. Color, sound, drama… Everything a really good math fact game brings to the table. Along with a really huge twist, an amazing “One More Thing” that I’m going to save for the end of this post. There many online flash card math games out there, and if you’ve seen the same ones I have, they’re dreadful. Most of them reinforce the idea that you do a few math problems to earn play time, which to me is almost psychologically predisposing kids to think that math is a sort of chore, or even punishment. There had to be a way to make the math practice part of the enjoyment and part of the reward, not the drudgery that gets you to the (lame) prize. What makes Math Flash different from other online flash card games? For one, the math facts are an integral part of the game… As you solve math problems, you’re building up a supply of color in the machine that will spray over the background. But you have to answer the facts quickly, because the machine leaks quite a bit. The more facts you answer correctly and the faster your answer them, the quicker you get through the level and the more colorful the artwork you’re building up. But importantly, the animation and the interactivity is happening while you answer the problems, and each problem you answer adds to the sense of progress you’re making on the level itself. The levels in each version of Math Flash (addition, subtraction, multiplication and division) are all tied to the Spaceship Math facts worksheets on this site. The levels start out with easier facts and gradually introduce new facts. You start with a set of the easiest facts for each operation, and subsequent levels add progressively more difficult facts to the mix. So the learning curve is incremental, but still rewarding for kids just beginning their journey of mastering a specific operation’s family of facts. As I mentioned, you’ll also see that if you’re slow to answer facts or if you get some facts wrong, it’ll take more correct answers to get through a level. This means if you know the easier facts, you’ll move quickly to the next level. If you’re still struggling with certain fact families, you’ll get more practice on the problems you’re slow to answer. If you wind up not answer enough problems correctly on a level, the game will end and you’ll be given a link to the worksheet focusing on the facts you need to practice. Also, if you miss problems, those will are show up more frequently. The game adapts itself to the specific skills and the specific trouble spots of individual players, getting them to the practice more on the math facts they need the most help with. Oh, and there’s one more thing. If you’re using Chrome on the desktop, and if you have a microphone, Math Flash will make use of the HTML5 Web Speech API to let you give answers to problems using your voice! When I built MathFlash, I wanted to recreate as much of that childhood flash card experience (sans the 70’s print couch) as possible, and this feels like an incredibly natural way to practice math facts. Kids without strong typing or mouse skills will find this is a great way to practice math at their own pace, and it’s really a showcase of what can be done in a web browser today. You’ll need a reliable internet connection, and for now it only works in Chrome, however the other browsers will hopefully implement this standard soon. If you don’t have Chrome, you can still play by clicking on the correct answers. I hope you’ll give Math Flash a try and make it a part of your summer math fact retention plans! I Got Skills… They’re Multiplying! We spend a lot of time focused on multiplication tables, and getting past the stages of memorizing math facts is an important milestone. By the time we are working with multi-digit problems, we’re starting to deal with algorithms, the series of steps, necessary to solve problems. Fortunately, learning multi-digit addition and multi-digit subtraction, even with regrouping, is usually achieved without too much difficulty. This calculator will let you multiply two long numbers together, and it shows you the intermediate products as it goes. Put a couple of numbers in there and hover your mouse over the work produced by the calculator… You’ll see what parts from the multiplicand and the multiplier are used to create each step, and it clearly shows how the place values are preserved as we work through the multiplier digits. It’s a great tool for developing an understanding of the conventional steps for multi-digit multiplication. But, the most important thing is practice! These multi-digit multiplication worksheets work hand-in-hand with the multiplication calculator. If you need review, be sure to also check out the complete series of multiplication worksheets, multiplication tables, and multiplication charts to really get your multiplication facts polished up! Posted by Dad on March 5th, 2017 in Worksheets Add Your Thoughts! Well, many thanks to DadsWorksheets.com visitor Tracy for pointing out that I had missed the target by a mile on the latest version of the bullseye math facts worksheets! 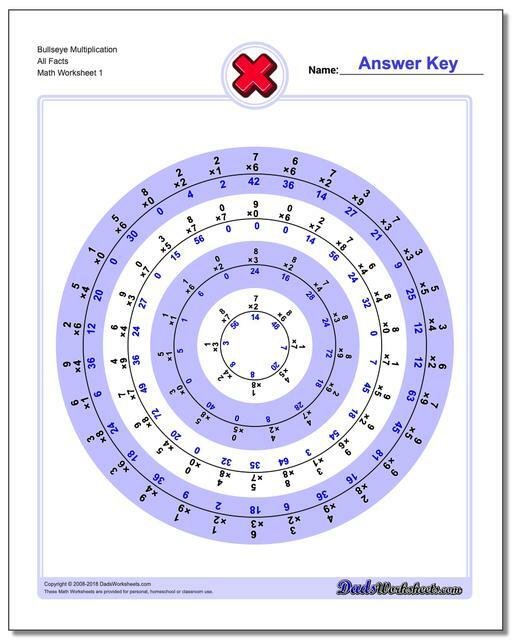 While the worksheets themselves were fine, the answer keys had the answers repeated in each ring. As if memorizing these math facts weren’t hard enough as it was. Regardless, if you haven’t had a chance to check these worksheets out, they’re a lot of fun and put a slightly different spin on memorizing your math facts. And they’re easier to grade now too!